Hello! 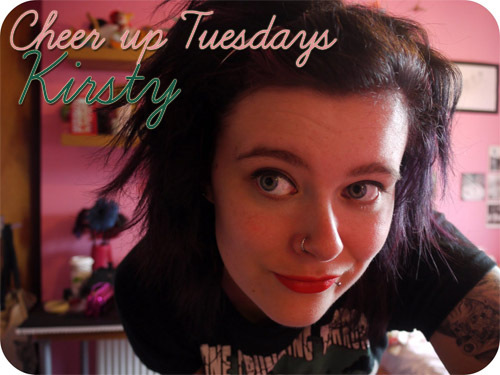 I’m Kirsty, I’m 22 and from Edinburgh in Scotland. I’ve just started studying HND Textiles at Edinburgh’s Telford College. I’ve done 4 different courses since I left school four years ago so I’m hoping this is finally the right thing for me. I started my wee blog when I was studying graphics a few years ago. My blog has changed a bit since then and I’m gaining confidence with posting outfit photos and whatnot, but I plan to start posting my college work once I get into it. – being in a nice pub with lovely people. – sending and recieving things in the post. – getting new tattoos or piercings! I have a pretty mixed up music collection and I’m one of those people who has to skip past 100s of songs to find one I want to listen to. If I can dance and sing along to it, then chances are it will cheer me up. At the moment my playlist would include The Misfits, Horrorpops, The Cramps, maybe a bit of Blondie, Xray Spex, Los Campesinos, The Pipettes and perhaps a little Die Antwoord (my guilty pleasure!). I also have a playlist of songs we used in my burlesque classes and having a wee dance to those always makes me feel good about myself. I’m not sure I can pinpoint one specific memory as my happiest. Most of my happy memories include hanging out with friends, doing silly things, going to gigs and out dancing – little things! One of my recent favourites is of the 2 weeks I spent in Florida earlier this year. Amazing food, sunshine and lots of theme parks, including Harry Potter which was fantastic. I’m not a morning person, so I wouldn’t like to get up too early. I’d visit some of my favourite places in Edinburgh – the museum of Scotland, art galleries. I would meet some friends for lunch in the gardens, get ice cream or milkshakes and then go shopping. Later on I’d have dinner and cocktails somewhere with Kevin, before meeting friends in the pub for a night of drinking and dancing. As someone who suffers from depression, I often find it difficult to stay positive. I’m learning not to focus on the negative or get stressed out about things that I have no control over. I try to appreciate the little things – even if my day is going horrible, I look for something to cheer me up. I try not to sit around and mope when I’m feeling down. I’ll head out for a walk around town or meet some friends for a catch up – anything to distract me so I don’t sit around feeling sorry for myself.